If there was ever a product seen on the Shark Tank that the younger Fans are going to love, I think the Surprise Ride Monthly Subscription Box will soon be at the top of that list. When thinking back some of my better memories when I was a kid, without a doubt, the most memorable ones was when I got a surprise in the form of a gift I was not expecting. It's like Christmas or your Birthday having all the excitement and anticipation of what's inside that new gift that has always made them so memorable. I think it's safe to assume if you ask any kid in this world if they would like to receive a big box full of all kinds of cool new things filled with a built-in learning theme to help inspire their creative imagination's the answer would be an astounding "Yes". Any kid would absolutely love getting a Big Surprise Ride Box in the mail every month and I bet the Sharks are going to love this business as well. The creative business owners and sisters Donna & Rosy Khalife who own Surprise Ride are coming into the Shark Tank with one goal in mind, to help teach thousands of kids about a new science project each month and having a really good time in the process. Yes I do believe I like this business models potential but what does it cost putting together an entire big box full of all kinds of themed surprises? And at what price point can the Surprise Ride successfully afford to charge the consumer including postage, and still make a decent repeated profit? According to the Surprise Ride Website the Khalife Sisters have 4 themed surprise boxes on display including Earth Day: Plant Experiment with a Mimosa Pudica, Luminescence: Learn How Things Glow, Chocolate: Make Organic Chocolate and Birdsville: Build a Birdhouse. Before even getting into price my biggest question would be how many Children will one Surprise Ride Gift Box cover? 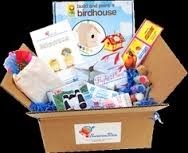 Would all my kids really need (or probably want) their own Surprise Ride Box or would one Gift Box delivered every month be enough for say 2 or 3 kids? I couldn't find the answer anywhere on the website but hopefully this question will come up sometime during the Shark Tank Show. Another concern the Sharks might have is with the pricing of the Surprise Ride. I'm assuming each surprise box is filled identically and at the same time, but why would one box cost $24.99 and the other $39.99? Percentage wise that's a Big Ouch and might be enough to scare away future customers before their kids get a chance to set the hook and "make sure" they re-order again. How much is the "Buying Power of Little Kids'? Looking back on some of the stuff I somehow was so easily persuaded to buy with nothing more than a simple "please", and the sad look that accompanied it, this is a Very Big Market that comes in many shapes and sizes. Yes I'm the first to admit my kids played me like a fiddle in that department but deep down I was always more than happy do buy something I knew would put a smile on their face. Spending $25 bucks a month to see those big smiling faces the surprise box could bring would be considered a bargain I would gladly pay for. But being forced to pay a higher premium upfront instead of maybe a discount to get me (my Kids) hooked on the product, I don't know, I guess it draws a red flag for me especially if it's a monthly subscription business model. It gives me the first impression the company "thinks" I might not want to reorder after seeing what I paid for instead of focusing on how surprised my kids are going to be when they get a big box full of surprises. If the Surprise Ride Box Gift Box is everything it says it is and the reviews are all positive (which so far they are by the way) then why not offer the first month at a discount and give the Kids a chance to do what Kids do best, help spend their parent's money? Who Knows? Maybe Donna or Rosy will read this article like Johnny George's of the Tree-T-Pee did in last week's episode and come out with a Shark Tank Special to coincide when they are featured on the Best Business Reality TV Show in History. Giving a little bait to all those little mini Sharks who will help close the deal for you, sure seems like a good idea to me. $10 Off "Shark Tank Special" Now available on the Website!!! Of course we'll read this and come up with a Shark Tank special! :) We love your blog. You'll see the discount code if you visit our website now. Hopefully it will make it easier for people looking for the perfect gift ahead of the Holidays! By the way, we no longer offer the one-time box. It was priced a little more because it was a rush box that we would ship right away. We decided that we would handle any special requests aboard the ride on a one-off basis! Hope you enjoy tomorrow's episode! What? Only a $10 Off Coupon??? lol,,(just kidding) That Looks Great!!! One thing I forgot adding to the article was my (other) opinion that might help grow this business is having a Surprise Ride Gift Box for us bigger kids. But son of a gun I just noticed you have also thought of that. "Great Idea"
I just saw the Shark Tank episode and prompted my wife to look into this. Wonderful idea and I plan on subscribing. Hi Rosy! I saw you last night on Shark Tank -- both you and your sister did such a good job. I'm so proud of you....Keep up the great work. Stay in touch! Our family watches Shark Tank faithfully. We were all impressed with the sisters and their Surprise Box idea. My daughter wants the "Chocolate: Make Organic Chocolate" box, but I don't want to commit to multiple boxes just yet. Is there an option to purchase just the single chocolate box? Just placed my first order! Can't wait to get our first box!! Target home school conventions and groups. Consider hiring consultants to save on marketing costs. Home school moms know how to market.